Combined Type 2 and 3 tested protector (to BS EN 61643-11) for use on low current (up to 5 or 16A) single phase systems to protect connected electronic equipment from transient overvoltages on the mains supply, e.g. fire/intruder alarm panels. Protectors with /BX suffix come ready-boxed, to IP66, for use in dirty or damp environments. Available for 90-150 volts, 200-280 volts and 232-350 volts supplies. For use at boundaries LPZ 1 through to LPZ 3 to protect sensitive electronic equipment. Use these protectors on low current mains power supplies, e.g. CCTV cameras, alarm panels and telemetry equipment. 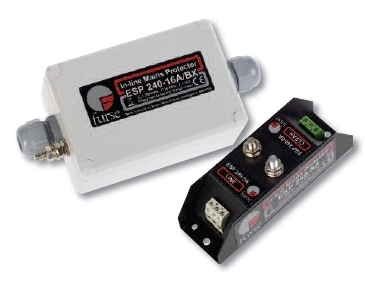 If several ESP 120-5A or 16A, ESP 240-5A or 16A or ESP 277-5A or 16A protectors are to be installed together, or if one is in use alongside Lightning Barriers for video or signal lines, these can be simultaneously mounted and earthed on a CME kit and housed in a suitable WBX enclosure.